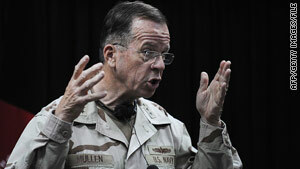 Adm. Michael Mullen, chairman of the Joint Chiefs of Staff, spoke with the chief of the Pakistani army Sunday. Senior U.S. military official says U.S. "not trying to pressure him as a result of this case"
Washington (CNN) -- The top U.S. military officer is reassuring his Pakistani counterpart that the U.S. military is not pressuring the Pakistani army to increase its operations against the Taliban there, a senior U.S. military official said. The message comes as the United States has turned up independent evidence that ties the suspect in the attempted bombing in New York's Times Square to the insurgent group. It stands in sharp contrast to tough talk from U.S. Secretary of State Hillary Clinton, who warned of "consequences" if the Times Square plot is linked to elements in Pakistan. Adm. Michael Mullen, chairman of the Joint Chiefs of Staff, called Gen. Ashfaq Kayani, chief of the Pakistani army, to discuss the matter Sunday. Mullen called to "reassure Kayani we are not trying to pressure him as a result of this case," a senior U.S. military official said. "Mullen didn't call to say, 'You gotta do more because this Pakistani-American was trained on your territory.' "
Gen. Stanley McChrystal, commander of NATO forces in Afghanistan, met with Kayani as well, and his spokesman denied McChrystal made any effort to pressure the Pakistani official. Clinton publicly took a tougher line, saying on the CBS program "60 Minutes": "We've made it very clear that if -- heaven forbid -- an attack like this that we can trace back to Pakistan were to have been successful, there would be very severe consequences." The senior U.S. military official was adamant in saying the U.S. military is not trying to make the Pakistanis accelerate their timetable to move against Taliban strongholds in North Waziristan, a border region long believed to be sheltering al Qaeda and Taliban militants. Kayani has repeatedly said his troops would not expand their operations into North Waziristan until they have finished operations in other areas. "We are very comfortable with the work they have been doing and where they are at the moment," the senior official said. Other senior military officials offer the same assessment. The military official said the current view has been reached even as intelligence increasingly indicates the Times Square bombing plot suspect, Faisal Shahzad, had "strong links" to the Pakistani Taliban. "We believe right now the Pakistanis are doing everything they can," the U.S. military official said. He declined to be named because of the sensitivity of the situation. The United States now has independent intelligence to indicate Shahzad had ties to the Pakistani Taliban, according to a U.S. official. The official could not be identified because he is not authorized to speak publicly. The independent confirmation is important because it gives the U.S. law enforcement and intelligence community a better understanding of Shahzad's activities without just following leads based on his interrogation. The official said the United States is still trying to figure out "how deep" Shahzad's links are to the Pakistani Taliban and "how high up" his connections go into the organization. But he emphasized that public statements by top U.S. officials about Shahzad and the Pakistani Taliban are "not just based on what Shahzad is saying." He would not discuss additional details about the other intelligence streams of information. "People are looking into other streams of intelligence that point in a serious way to links to the [Pakistani Taliban]," the official said. President Obama's top counterterrorism adviser, John Brennan, said Sunday, "It looks like he was working on behalf of the Tariki Taliban Pakistan, the TTP, that's the Pakistan Taliban. This is a group that is closely allied with al Qaeda." U.S. Attorney General Eric Holder, speaking on NBC's "Meet the Press" on Sunday, went further, saying that the plot was directed by the Pakistani Taliban. "We know that they helped facilitate it; we know that they helped direct it," Holder said. "And I suspect that we are going to come up with evidence which shows that they helped to finance it. They were intimately involved in this plot." The U.S. official also said the United States is trying to get a better understanding of the TTP's own source of financing. While acknowledging the risk posed by a single Taliban operative, he also said there are indications the TTP lacks extensive financial resources and it's not clear it could set up an extensive operation in the United States. If U.S. intelligence can determine and isolate a target precisely tied to Shahzad, such as the training areas where he might have been sheltered, the most likely scenario is that the U.S. government would call in drone strikes to ensure any lethal action is as precise as possible and potential civilian casualties are minimized, several officials have told CNN. In other news from the region, the U.S. ambassador to Afghanistan says the relationship between the United States and Afghanistan is as strong as it's ever been. At a White House news conference Monday, Karl Eikenberry acknowledged that there have been "ups and downs" in the relationship with Afghan President Hamid Karzai. But Eikenberry said he expected the two countries "to be able to work our way through difficulties and come back together and still find ourselves well-aligned" as a result of Karzai's visit to Washington this week to meet with Obama. Also at the news conference, McChrystal said there will be increased violence in Afghanistan "as our combined security forces expand into Taliban-controlled areas" in the south.